French style landscaping is all about creating a series of geometrically ‘rooms’ divided by clipped boxwood and delineated with gravel or stone pathways. Whilst there’s room for romantic touches and expressions of individual style, the French garden is all about neatness, balance and simplicity. 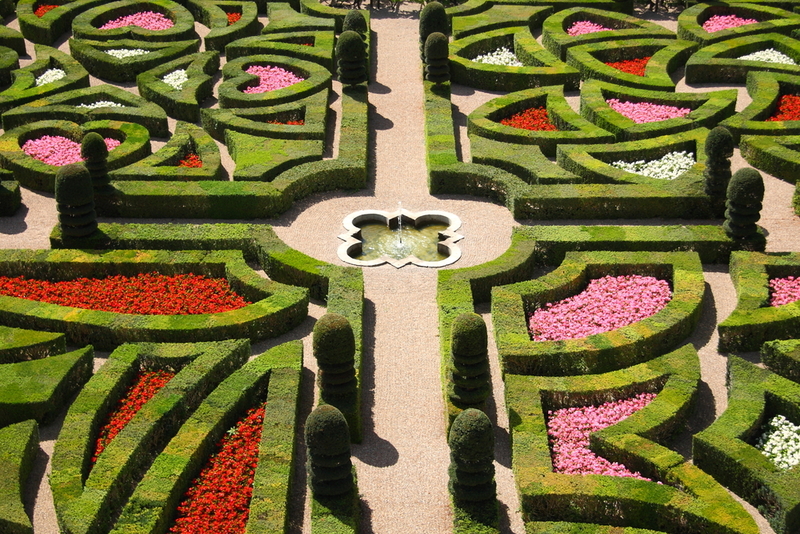 This week, we look at some of the key elements of the French landscaping style. Gravel lined paths and stone terraces are literally the foundations of a French garden, creating straight, geometric lines whilst adding texture, contrast and colour. Although gravel and stone is traditional, exposed aggregate concrete is a low maintenance, more cost-effective alternative to consider if you’re working with a tight budget. Excepting the romantically themed French chateau garden depicted above, traditional French landscaping maintains a cool colour palette of whites, greens, blues and purples. In keeping with the geometric lines established by the paving, French garden beds tend to heavily feature sculpted box hedges and symmetric planting styles. A lavender plant is also a French garden essential. Introduce some contrast to all those neat geometric lines you’ve established with a romantic climber plant and tap into the chateau aesthetic. Traditional choices include honeysuckle, grapes, climbing roses and Boston ivy. If you want to achieve the French rustic vibe, the best way to do so is to invest in traditional landscaping materials like metal or brick garden edging, glazed pottery for pot plants, tastefully aged wood for garden furniture and shabby chic wrought iron for the garden gate. Plastic should be avoided at every turn as it looks flimsy and will cheapen the overall effect. Of course, following these garden design rules to the letter will result in a slightly sterile landscape so it’s important to add a little something unexpected like an unusual plant, a curved path, a mosaic table, or an elaborate garden light. If it feels like it’s working for you then follow your instincts, truly great gardening follows no rules. A Better Driveway are specialists when it comes to installing decorative hardscaping solutions like coloured concrete and exposed aggregate in Melbourne. To learn more about our capabilities, please don’t hesitate to get in touch with us by calling 9308 6112.